Butter chicken was born in the kitchens of the Moti Mahal hotel in Delhi in the 1950s. Today, it is among India's best-known foods the world over. Many restaurants around the globe have versions of it that are not authentic at all. So before you learn what authentic butter chicken should look and taste like, you should know what it shouldn't be like—sweet, loaded with food coloring, full of raisins or tomato ketchup. Butter chicken is of North Indian origin, Punjabi to be precise. It gets its lovely, distinctive flavors from the tangy tomatoes, yogurt, and smoky kasuri methi (dried fenugreek) added to its gravy. This can be made as hot or mild as you like so it suits most palates. 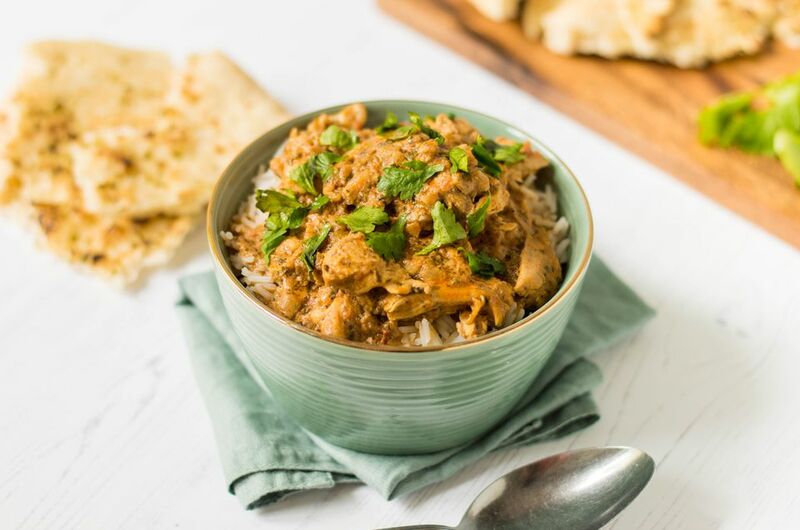 Also commonly known as murg makhani, butter chicken tastes great with kaali daal (black lentils), naan (flatbread), and a green salad. This recipe for butter chicken is the real deal. If it feels like the list of ingredients is exhaustive, please don't allow that to deter you—they are all just commonly used ingredients in Indian cooking. We suggest making the spice powder from scratch (as in the recipe) since this will give you the best results. Mix the chicken, lime juice, salt, and red chili powder in a large, nonmetallic bowl. Cover and allow to marinate for 1 hour. Heat a flat pan or griddle over medium heat and gently roast (stirring frequently) the cloves, peppercorns, cinnamon, bay leaves, and almonds until they darken slightly. Cool and add the cardamom seeds. Now grind into a coarse powder in a clean, dry coffee grinder. Mix the yogurt, spice powder (from the previous step), ground coriander, cumin, and turmeric and add them to the marinated chicken. Cover and allow to marinate for 1 more hour. Heat the oil in a deep pan over medium heat. When hot, add the onions. Fry until pale golden brown in color and then add the ginger and garlic pastes. Fry for another minute. Add the chicken (reserving the marinade) and fry until chicken turns opaque and the flesh goes from pink to whitish in color. Now add the ground tomatoes, chicken stock, kasuri methi, and the reserved yogurt-spice marinade to the chicken. Garnish with coriander leaves and serve with naan and kaali ​daal. For an Authentic Cooked-Over-the-Coals Flavor: When the butter chicken is cooked, make a small bowl shape with aluminum foil and place it on top of the butter chicken (so it is "floating" on it). Heat a briquette of charcoal on an open flame until red hot and gently put the charcoal into the aluminum foil bowl. Cover the dish immediately. Remove the cover just before serving, discard the foil bowl and charcoal and serve. The chicken will be infused with a smoky flavor.